Pappagallo’s Satellite Beach has grown in steps over our 28 year and counting. When we started at our first location we were 5 booths and no servers, just order at counter have a seat and we’ll bring it to your booth. Second location had 10 tables sat 40 people and by then we had added servers as well as delivery and catering service. Pappagallo’s Indian Harbour Beach original location was open for 4 ½ years followed by our second location in Indialantic where we spent 14 ½ years. In 2008 we made the move to our current location at 1769 A1A in Satellite Beach, over the last 10 plus years we have expanded this location 3 times. Each time upgrading our decor equipment and hopefully overall dining experience along the way. Pappagallo’s Satellite Beach has survived through fires, several hurricanes and many other problems that are too numerous to mention here. I recently heard that 90 percent of all small businesses that start end up closing within the first 5 years. Let me say up front that it never makes me happy to see any business close. Doesn’t matter if it’s another restaurant down the street or a dress shop next door. 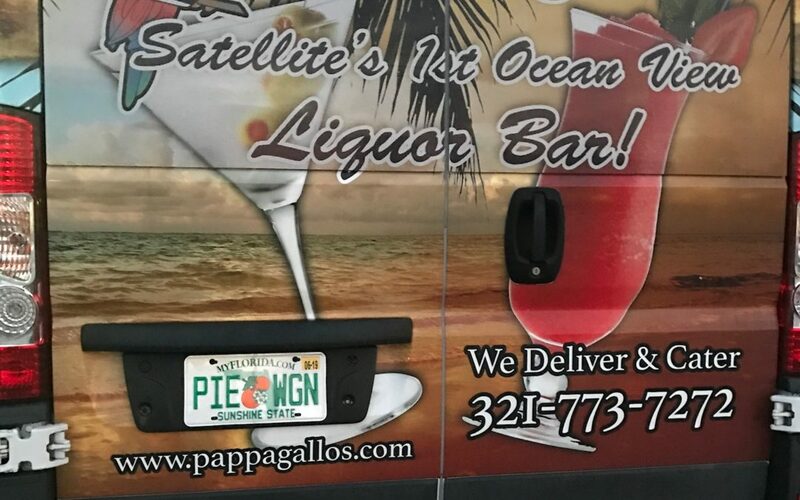 Pappagallo’s Satellite Beach has been open since 1990 but we have had 2 other locations (not named Pappagallo’s) that we had to shut down. One due to storm damage to the building we occupied and the second due the economic slowdown of 2008. I’m telling you that so you understand that I know what it’s like to have to admit to yourself that the dream you had of running a successful business at that given location was not going to work out, basically you’re in that 90 percent. The next time you are driving around town and you see a place with a sign that says closed or going out of business, before you say to yourself “I knew that place wasn’t going to make it.” take an additional minute to realize that whoever opened it, and is now closing that store, is having to admit to themselves that their idea or dream for a business didn’t work. Shutting down a business is a very painful experience. On one hand you have the relief to the end of a losing battle but the financial loss pales in comparison to the loss you feel at failing to execute what you spent so much time and effort building. Pappagallo’s Satellite Beach has been through a lot. A few time along the way situations came along that threatened if we would make it through to the next chapter. So in saying all this I hope that if you’ve never owned your own business you may now have a slight understanding when you see the next going out of business sign. After being around 28 years most people will stop in and may tell us what a great success being open so long is. I do feel very lucky to still have the chance to do what I love for a living and to be a part of the community that I’ve lived in since 1980. More than that though, I have learned that nothing lasts forever and how after how good you are at your job or your business it can all slip away if you forget how you got there in the first place. Pappagallo’s Satellite Beach has learned many lessons by watching these places close. Like I said I truly feel bad for whoever owns these stores when they close. If the business had been open for a while I ask myself what changed that caused them to eventually close their doors? Pappagallo’s Satellite Beach is a restaurant so that’s the business I tend to focus on. Usually what I see from places is that they start out doing all the right things, food is good, prices are fair and people are pouring their heart and soul into the place. Sounds like a recipe for success right? Opening a business is time consuming and incredibly demanding of the owner, especially at first. I remember when Pappagallo’s Indian Harbour Beach first opened working 16-18 hour days 6 days a week and opening late on Monday’s just so I could get errands for the business done. As time has gone by I have seen many mistakes made by owners and I admit I’ve made more than my share of bad decisions. Every time I make a mistake I try to figure out the lesson to be learned from it. Me- Ever run a restaurant? Me – how many hours a week do you think you’ll have to work? Them- “oh I’m gonna hire someone to run it for me I’m gonna be there part time. Me- what makes you choose the food and beverage business? I can’t tell you how many times I’ve heard this but these folks put their whole life savings into this venture and they don’t have a clue about what they’re getting into. A few months later I’ll run into them somewhere around town and ask how it’s going, even though I already know. They quickly found out there is no part time restaurant owner All their time is spent doing everything but making that peanut butter sandwich. They found out that people aren’t always who they are. Every cook thinks they know everything so the chef changed the peanut butter sandwich recipe to make it better. Restaurant owner is another word for business caregiver. You do whatever it takes to keep that business alive even if none of it is what you wanted to do in the first place. Most of the time the new restaurant owner comes back in a few months and they’ve either closed down or sold it to the next guy who starts down the same path. I don’t think that people understand that business is a lifestyle in the beginning not a job. If you’re not working in the store you’re out running errands for the store. I can’t tell you how many family events that I had to work during and couldn’t attend, too many birthday holidays and even funerals to count. I’m not mad that this is the way to Pappagallo’s Satellite Beach serving this long I’m actually happy that my time invested allowed the business to go on. I really think that a lot of businesses fail because of that fact alone. People have no idea what they’re getting into and when they figure out just what it takes they decide it just isn’t worth it and they move on. What I personally know about business can probably fit in a small notebook. Maybe a scrap of paper. What I do know is that you have to show up …every time. There’s no paid vacations, no sick days that multiply every year, no raises just because you’ve been there a year. Matter of fact there’s times you don’t get paid because something inside the business goes bad and you have to use all your money that week to fix whatever it was that broke. After all that gloom is considered I still love what I do and can’t imagine my life without having Pappagallo’s Satellite Beach as the place I work. So you may ask at this point if I consider myself a success? I do but not for conventional reasons. For me success is not money in the bank, it’s relationship with the people you spend time with and how you treat people on a day to day business. I don’t think there is a dollar amount that could buy the feeling that I get when someone who worked at Pappagallo’s Indialantic or Indian Harbour Beach 20 years ago stops in to say hi and tell me Pappagallo’s Restaurant was the best job they ever had and they never forgot the days spent working here. Those memories define my success more than any amount of money left in the bank somewhere.